At the end of last year, we debuted our desktop app for Bitrix24 that works on both Windows (download) and Mac (download) platforms. This app lets you replace whatever traditional internal messenger you are using now completely. 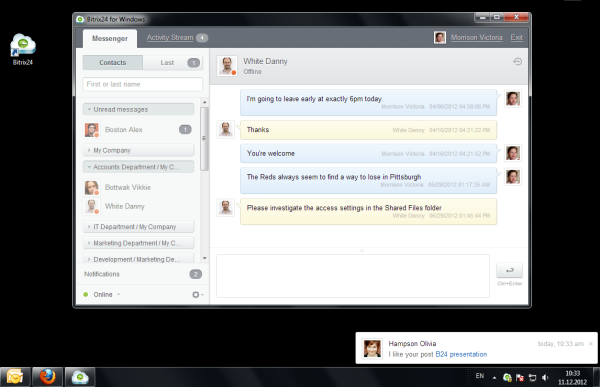 Without opening a browser, the desktop app lets employees stay in touch. Personal messages, notifications from the Activity Stream, likes and comments, and incoming task notifications are also visible through the app. 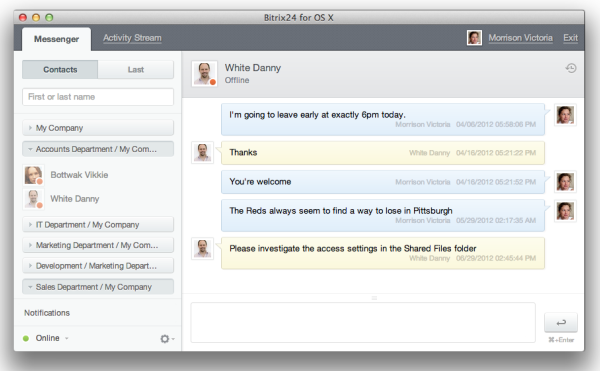 After installing the application on your desktop you will see the "Bitrix24" icon. The application window can be reduced to the icon in taskbar and tray. When a new message (notification) comes, the app icon and pop-up window will notify you, so you will always know when something new comes in or when you need to open Bitrix24 in your browser. Right now, the desktop serves as a corporate messenger, but in the upcoming release it will begin to work with network file storages (your files in Bitrix24 will automatically be synchronized with files on your computer). The desktop app and the mobile version turn your Bitrix24 a fully interactive, go-anywhere digital workplace.